* Note that I am part of the national Arby's brisket project. They covered the meal and sent me a kit to make a brisket myself to compare. Products and compensation were in exchange for participation and a fair, honest post (as are all mine). They also provided the free sandwich tickets for the contest. 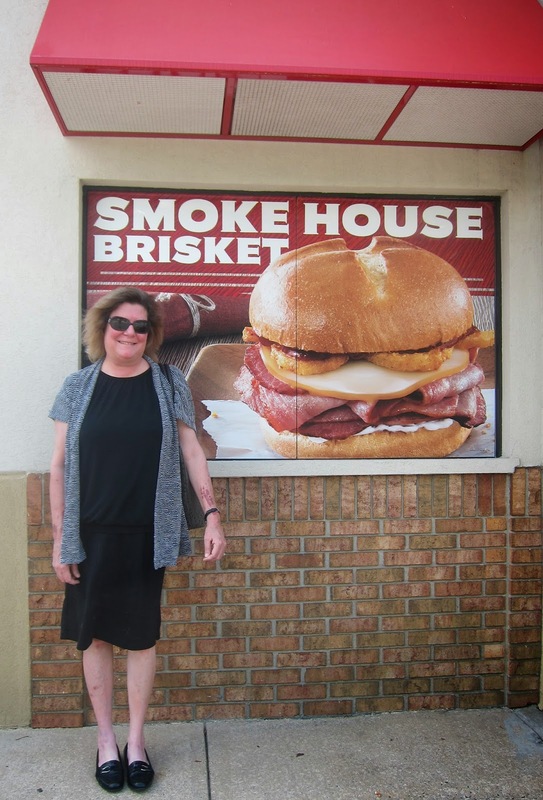 I'm part of the barbecue blogger team that Arby's asked to check out the Smoke House Brisket sandwich. So, today, my son and I took a break after exams and went out for lunch and got our brisket on. I love to eat and especially smoked foods. It's hard to get brisket here in pork country, so this was a treat. The Smoke House brisket sandwich has thinly sliced brisket which is moist. There is a very fine bark on the edges and just a tiny sliver of the fat cap. I usually remove all fat at the table, but this was thin and did not detract (for me). On top of the meat is smoked gouda cheese (one of my all time favorites) and then the house onion rings. I don't usually put things like that on my sandwiches, but this worked perfectly. Even if you think you don't like onion rings, the balance is better with them, and you don't get a big onion ring flavor. The sandwich was lightly sauced with mayonnaise and barbecue sauce. I could not detect the mayo. The flavor is sweet and tasty. I like heat so I added the Arby's horsey sauce (horseradish). Do a taste test on that first, because it might be too hot for some. I'd call it a low heat, but tastes vary. I really enjoyed my meal. It did not taste like my brisket. It did not taste like any I've had. But, I've never had two briskets that tasted the same. Brisket is a slow cook meat, and the time, rubs, sauces and so on make every smoker's brisket a little different. Frankly I'm surprised a fast food restaurant could pull off one of the harder meats to get right. And, they did a very fine brisket sandwich. It was really tasty. 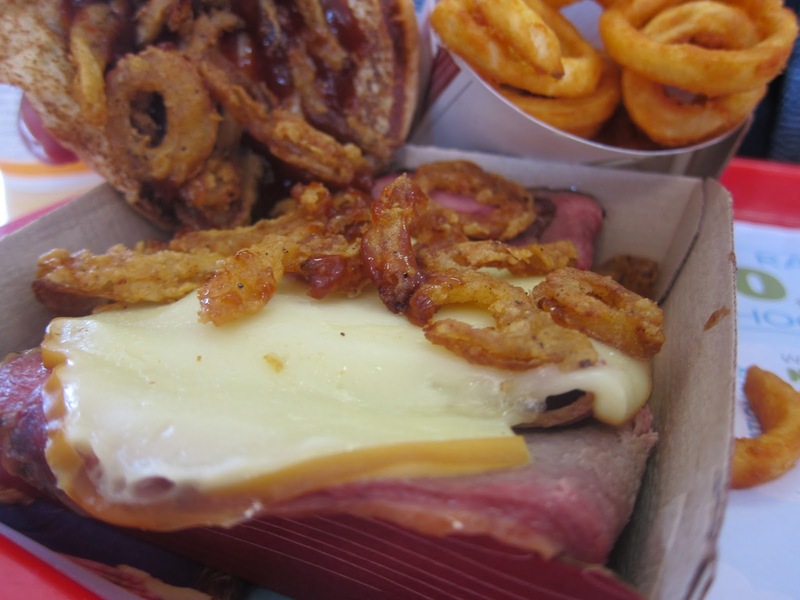 Want To Try Arby's Brisket Sandwich? Want to try this out yourself and for free with a fun contest? Arby's gave me two free brisket sandwich coupons. If you leave a comment on my blog and any way to let you know if you win, then two lucky readers can get a brisket sandwich for free with the contest ending on May 13 at midnight EST. Can't beat that. There it is. Easy as can be. No hoops. No spam. Just leave a comment and if you want to do extra entries, that's fine too. 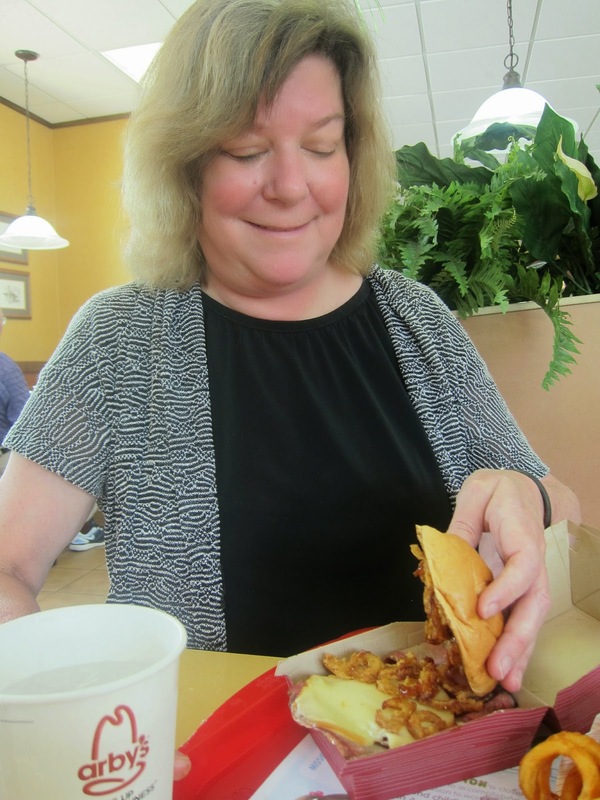 I'd also like to note that our local Arby's in Salisbury, NC was fabulous. You know it's kind of odd when a woman comes in and starts taking photos. I spoke to the cashier who got the manager to double check beforehand. Both women were extremely nice and helpful when I explained about the blogger project and were excited about the idea. I'd also note the location was ultra clean including the bathroom. It's across town, but I'll get out there more. They really were doing an extra nice job across the board. I tried Arby's Brisket last year and thought it was delicious! I can't wait to go buy another! I would love to give this a try. It looks delicious! I've seen this promoted and I'm not sure how I feel about gouda cheese on brisket.